If Parenting is a Job…. Parenting is the least prepared job anyone has signed up. I’ve not sat in a lecture hall prior to the birth of my eldest educating me on the do’s and don’ts of parenting. I have not passed any examination certifying me to be a licensed practitioner although this is the profession I am expected to perform 24/7. Continuing education is on-going all the time since new parenting books and theories are hitting the market faster than technological advances. Has the most critical appraisal since 360 degrees feedback existed way before the corporate world adopted this system (or so I chose to believe). The only job that makes you feel like you are always failing rather than surviving. Expectations to perform right from Day 0. Where is the internship programme? You pretty much learn OJT (on the job training). Long working hours with little remuneration. Lack of structured career pathway and progression plan. Lack of personality mapping to the ideal career option. You get kids that are least compatible with your personality type and you struggle to find ways to get out of your shell. Apart from this highly demanding profession, you are expected to moonlight to amass sufficient funding for future investments aka education. You wonder daily when is this going to end and yet fears an early retirement. You run the risk of stress-related disorders and yet, medical benefits are non-existent. You take a day off and return to pick up the tasks where you had left off 24 hours ago. You wanted to resign but sadly realised this is a one-man show. I never could understand why other bloggers would post a 50-word “I’m back” post after disappearing from the blogging scene for a while. Over the last few years, there were many moments where I planned to rejuvenate my blog. There were experiences I wanted to share and thoughts I needed to document. But adulting and parenting took precedence. Then there was the thought of waiting for the perfect post, the perfect visual and yada Yada….. The succinctness of a post is simply to fulfill a personal commitment. Guilty of Playing Favourites….Who Else but Me! Lately, I received comments that claimed I was bias towards certain groups of people. Ah bother! This had been the most disheartening comment for me as I had always viewed myself as an objective individual, who is able to treat each and every individual as just and impartial as possible. It was mostly true until…….I became a mother. With three kids, many like to come up to me and ask who is my favourite child. Why does it matter to you who my favourite child is? Then, they will like to speculate and inform me through their observations, who they think my favourite child is. This went on for quite a while and it reached a point where I was convinced my emotions had betrayed me and I was playing favourites. It haunted me so much I pressed Miao for answers. He agrees and disagrees to a certain extent, which bothers me even further for someone so close to me to make such an observation. It created such emotional turmoil to me that I started to play making up. I was convinced I am bias and I do have a logical explanation for that. It has nothing to do with their personality or their degree of compliance. Instead, it has every bit to do with mama’s guilt. I guess it is universal to all, how with more kids you try to compensate those born later with a bit more love and tenderness. So yes, if this holds true, I am guilty of playing favourites, guilty to the core and unless I can banish these thoughts, the biasness will always be there deep in my heart because I have failed to devote more of myself for them. However, does this mean I shower one with more kindness than the other? I don’t think so. I do think I am still pretty constant in meting out punishments and praises accordingly. Then, why do people say that I am bias? I peform something called situational biasness. For example, a family member favours Xmm more because his personality reaches out to them. During such times, he or she may unintentionally be less understanding towards Xxm whose personality traits differ vastly and he is still incapable of playing to other’s heart. Times like these, I am bias towards Xxm because I feel a need to protect him. I cannot control other’s emotions towards him and I will act in my capacity as his mother to understand his behaviour and put a stop to whoever who is passing on hurtful remarks to him. 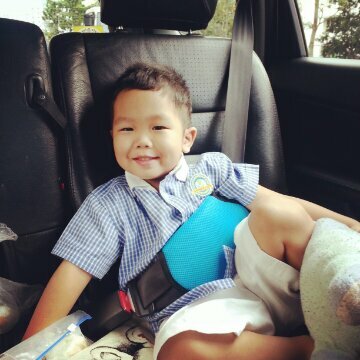 For Xmm, the biasness comes when I am coaching him in his academic skills. He does not take to books like Xxm and is pretty much free-spirited in this area. This is when I tend to be less harsh on him when it comes to learning because I needed to sustain his interest. On the other hand, Xxm is an introvert and by nature, devours information from books. He however is a bit of a drifter which is something I come down pretty hard on him. Lastly, Xmx….they say the last child is always the parent’s favourites. And they press you for answers to confirm that it is true. Indeed, I don’t push him to know his ABCs and 123s. He can make more mess and get away with it. However, this stems from parenting through experience. I have observed how the older two has grown with all my trial and error and seriously with children, you do not sweat the small stuff. So yes, I am less harsh with him, not because he is more adorable although he really does have the sweetest voice of the three. And honestly, with him at slightly under 2 years of age, what’s more could I expect of him except for my last baby to not grow up too quickly and lose his innocence? That is all I asked from him these days. Yes, the standards have dropped and the adoration for him is at 100%. I call on others to cut me some slack on this. Parenting, in the last 5 years, had nothing to do with moulding the boys’ characters. Each of them is beautiful in their own way and all one really need to do is to appreciate their gifts and work on their misgivings. Parenting had in fact been a road of self-discovery for me and the person who really needs some moulding or shaping up in character is yours truly. For them, I needed to walk out of my comfort zone and be the mum each needed. This is a lifelong journey for me and one that I have not entirely master. In fact, it has one of the steepest learning curves. But as their biological mother, this commitment is sealed with blood ties, which runs deep and long. 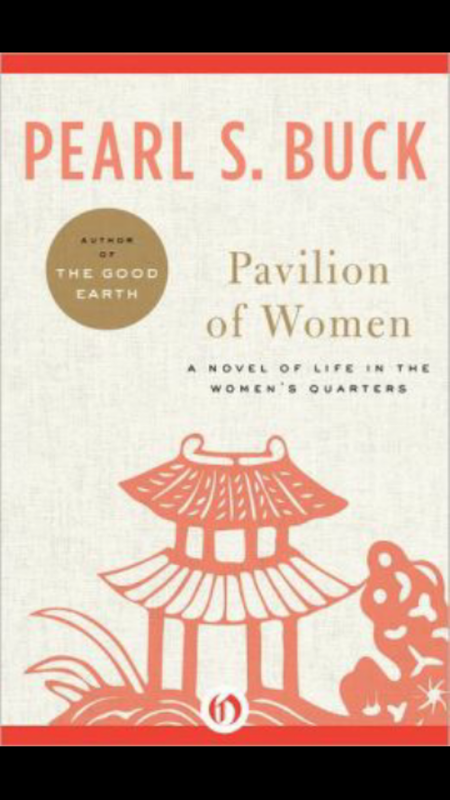 Disclaimer: This is not a book or movie review of Pavilion of Women by Pearl S. Buck. Here are some of my thoughts and feelings after reading this book. If you really need to know how this book fared, I’d say it’s definitely worth five sparkling stars. The story is set in pre-World War II China. It begins with Madame Wu, who decides to retire from her duties on her fortieth birthday. At the top of her list was the physical duty to her spouse to consummate. She thus decides, to find a concubine for her husband for it makes more sense that she chooses one of both her and Mr. Wu’s liking than for Mr. Wu to bring home another which only he approves of. Upon hearing Madame Wu’s plan, I was intrigued that perhaps such a woman did exist in those days. Firstly, it is unbecoming of a woman of that era to have such a radical idea. Concubines, though still common was steadily frowned upon as the country rids itself of its Manchurian ways. To invite one in out of one’s free will seems unthinkable. Moreover, I cannot fathom a day which I can retire from my womanly responsibilities and duties. What’s more, at 40 years old?! Indeed, it never did cross my mind to see it as an option like Madame Wu. In my present world, I’ve only known about retirement from work. With the retirement age gradually held back year after year, there seemed to be a missing light at the end of the tunnel. As women fight for equality in status, roles are piled one after another. Relinquishing one role only means your absolute dedication and contribution to another. Perhaps I am traditionally minded, for when I started this child rearing business of my own, I felt a woman’s business should first and foremost be her family. It is counter-intuitive to think that one can juggle it all, to have the work-life balance that one desires. Truth bespeak, a balance is a fallacy for how can there be one when there is a lack of commitment to either. One finds it extremely difficult to safeguard this balance when one’s soul is extracted in multiple directions. Madame Wu choreographed the entire event with resoluteness and efficiency. I find myself drawn to Madame Wu. I desire the qualities in her. I admire her for giving birth to such a radical idea. I love her independence, her fair-mindedness, her composed nature, her beauty and her intelligence (both IQ and EQ). In the household of 60 which she manages, she is both feared and revered. She has the prowess of the mind, but yet the execution of her thoughts are delicate and non-compelling. She is what sages say a woman should be – like water. Self-giving, nurturing and life supporting. Fluid and adaptable. To bring forth hail when necessary and appropriate. I yearn to have her strength of the mind, and her capabilities. Madame Wu was, in fact, all I wanted to be. The story then unfolded with her meeting a foreign priest who is the embodiment of knowledge and wisdom. She discovers a life beyond the four walls, and for once, she felt her soul released. She felt trapped in her time and space. She desires to soar and in order to do so, she realizes she needs to ensure everyone’s happiness so that one by one, their dependence on her will slowly recede. She saw to herself to arrange for her third son’s marriage, to salvage her second son’s failing marriage and of course, to ensure that the newly found concubine is well liked by her man. She believes that with her duties fulfilled, she can then be free of them. As the author slowly revealed, her collectiveness arises due to her lack of love for the people she calls family. Even when her children were born, she didn’t feel like a part of her was estranged from her. Instead, she felt whole again. As I read this, I felt that Madame Wu’s feelings speak of my personal childbirth experience. I was not the mother who cries with the birth of her child. I never felt compelled to do so. I wondered why. It made me question the Love I have for them. Sometimes I wonder if I am a lesser mother. Do I then, like Madame Wu, is a person devoid of love and thinks always and only of herself? “How shall I be rid of myself?” she asked Brother Andre. “Think only of others, ” he replied. “Does that mean I am always to yield to others?” she asked. “If not to yield means that you are thinking of yourself, then you must yield,” he said. It may be so. When I was young, an aunt commented that I was selfish. I have worked hard to correct this in my growing years, and I certainly do not have any issue parting with material belongings. I am selfish for I put the sanctity of my mind above others. Madame Wu found the freedom of her mind through the love for Brother Andre. Alas, the answer to the serenity of my mind does not lie in love. Admittedly, I do not believe that love frees a person. I too seek the thing that will uplift my spirits and transcend my soul to higher grounds. In Blueberries for Sal, one of the major themes that we explored together was to nurture the habit of following closely. In this story, Sal and little bear were separated from their mothers when they were overly engrossed in blueberry tasting. As in all good children’s books, it was a happily ever after ending despite an identity mix-up. This story was excellent and instrumental for me to drill the importance of keeping by my side whenever I communicated the need for it. The boys behave very differently when we go out together. Xxm is a drifter and constantly falls behind the troop. His spatial awareness skills are relatively ill developed, which makes losing us in his sight very easy. In addition, his stress coping mechanism needs much love too. Xmm, on the other hand, tends to wander about in his usual carefree spirit. He is more often than not ahead of us, which is usually okay if what lies ahead is not a road. Though he veers from the intended course, most days he is still aware of our whereabouts. With such a troop, the team is usually scattered and subjects me to much stress. Hence it was wonderful to raise awareness of keeping pace with me, and not them, with the aid of this book. We live in the city and it is difficult to correlate the themes in the book with our real life. Being Chinese, canning blueberries has never been a way of life for us. With the high price of blueberries at the supermarket, I am less inclined to demonstrate the process of canning blueberries. We took to making blueberry muffins instead. 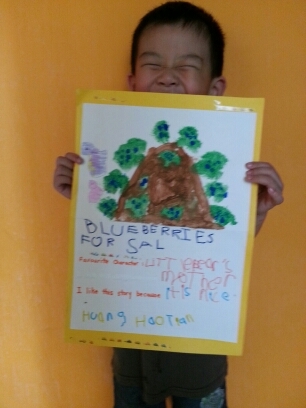 Xxm’s school needed a book review so we sat down to working on Blueberries for Sal. We painted the picture based on an idea I got off Google. 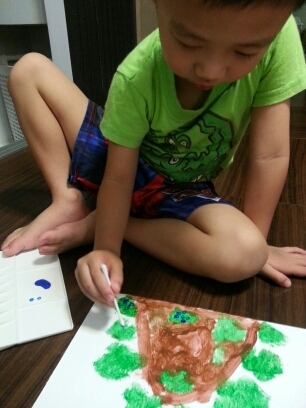 He likes painting and gladly does the assigned task. Then I created sentence prompts for him to fill in the blanks. Despite numerous attempts to explain what a book review is, Xxm could only repeat the story. After listening to it a couple of times, it then struck me to record it. Aha! Narration – a skill much advocated by Charlotte Mason followers. 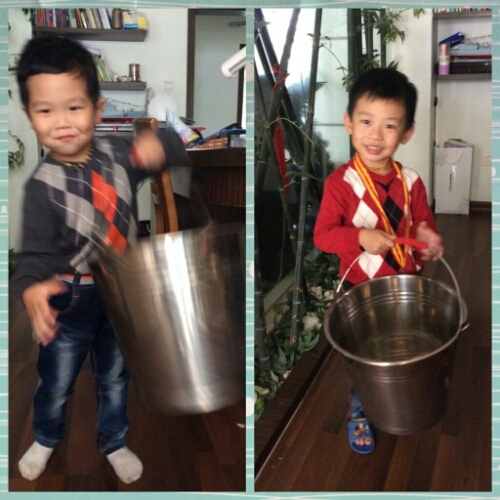 I wanted very much to display the sounds made by different objects in a tin pail. I tried initially with a small metal bowl, but the effect wasn’t that good. The opportunity came when we spotted a tin pail in a relative’s home. The boys were excited to enact the whole berry picking scene. We didn’t have berries, just leftover tangerines from Chinese New Year. Thus, we played a game of hiding and seeking tangerine which delighted them all afternoon. As we dropped the tangerines into the tin pail, I highlighted to them the difference in the sound produced by different sized tangerines. I wanted to upload a video of them having fun but I am facing difficulty uploading it to YouTube from my iPad. So, please make do with their pictures. 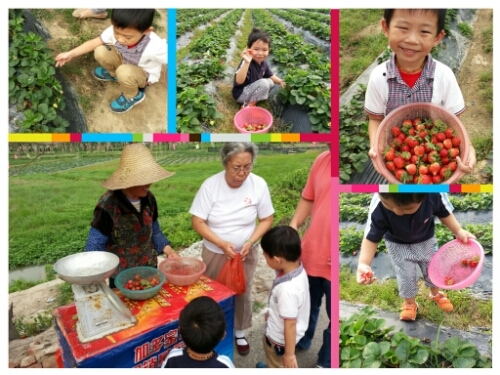 We also struck gold when we had the opportunity to go strawberry picking in China. The boys were trilled. Though Xxm was feeling unwell that day, he participated wholeheartedly. Lastly, I demonstrated simple addition sums to wrap up our entire learning. 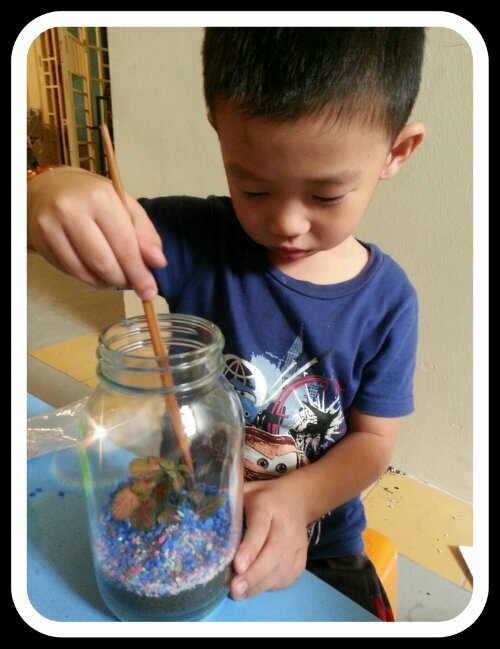 Xxm is turning five this year and yes, we are still on the BFIAR curriculum which is geared for ages 2-4. 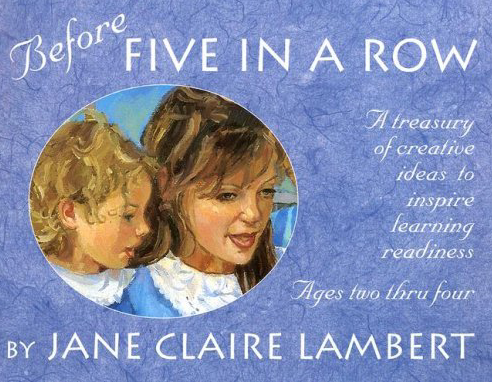 We have been following the curriculum loosely, and not the recommended five days for each row. Sometimes, it takes me weeks to assimilate enough resources and time to execute the activities that follow after the book to complete the row. Of course, BFIAR proponents will claim that reading the books diligently five days a week is good enough. That, however is also elusive for me as there are many nights a week I returned home past the boys’ bedtime. 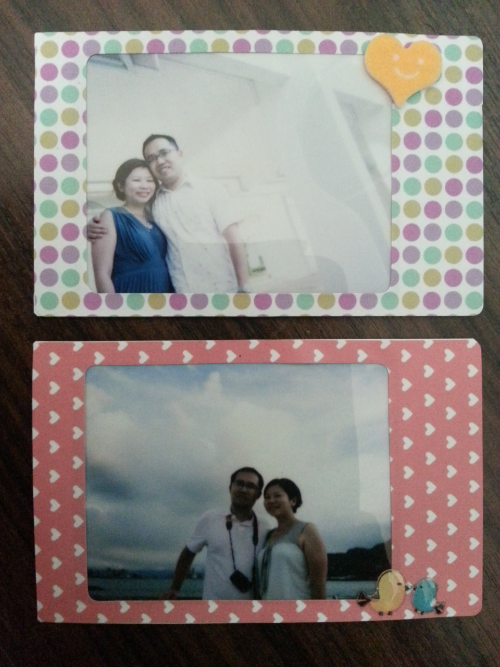 With the subsequent arrival of Xmm, I was inclined to delay the row so that he too, can be included in the fun. Hence, the BFIAR serves as a useful book list for me. I have come to love the BFIAR books, many of which I have never known existed prior to embarking on this journey. BFIAR is an even greater learning experience for myself than for my children. Lol. I am beginning to appreciate what good literature entails. It speaks volumes to me that the boys remember the storyline days after our read-a-loud. Through my long journey, I have also come to realise that it really doesn’t matter if I planned many activities related to each row. Going a Google search on BFIAR activities throws up so many blog posts of well executed and fun BFIAR days that it leaves me unsatisfied if I have never done one-tenth of what these wonderful mommies have accomplished. Many times, I have hesitated to row a book simply because I do not have the time to do any meaningful and fun activities with them. When I try to plan and incorporate many home learning experiences, somehow, the experience wasn’t as sweet as dramatising the story aloud. The OCD planner in me wants to feel accomplished by checking off the task list more so than anything else. For this OCD planner, it is a major boo-hoo when plans fail. And plans fail, very often, in this household. This is also the other reason why the BFIAR series is still ongoing in this home. Penning this down serves as a reminder for me to simply be a mum to the boys. I read that what the child needs is a mother, not a teacher. This statement really struck a chord with me. So expect more from our BFIAR series. No funtastic follow-up activities from this momma. Just simple mother to child snuggle up time. It’s amazing and so incredible that even though the polaroid camera looked askew each time, these wonderful memories were captured through the eyes of our 4 year old. Home learning has taken a huge backseat for the last couple of months due to my heavier work commitments. I set out to do this ocean animals theme in July 2013 but only found the time to implement it sporadically from August to December 2013. It’s amazing that the boys’ interest can be sustained for so long. The appeal of the deep sea first came from a Disney Nature film “Oceans”. “Oceans” explores the mysteries of the ocean through the eyes of a boy who wonders what marvels lies beyond the coastline and beneath. The film was taken over Earth’s five oceans and offers an unprecedented look beneath the sea. Unlike most documentaries, there was no narrator in this film. The powerful cinematography speaks for itself. The musical pieces stirs and arouses the emotions. One feels both the calming and gentle effect the sea brings forth and also the fierce tension as the sea creatures engage in battle. The finale draws a compelling message of the influence of man’s activities (overfishing and water pollution) on the ocean. The boys have been rewatching this film for at least 3 to 4 nights every week the past month. When Meow tried to introduce other oceanic documentaries, Xxm still chose “Oceans”. Xmm typically watches the film from afar. Regardless of the number of times he watches this film, the fighting scene between a crab and a shrimp scares him. Despite this, he is still very interested in the film. Hence to extend our learning of the movie, we primarily read. Loads and loads of books about the ocean animals. In one of our reading, we discovered that whales typically swim in groups called pods whereas sharks prefer to swim alone. 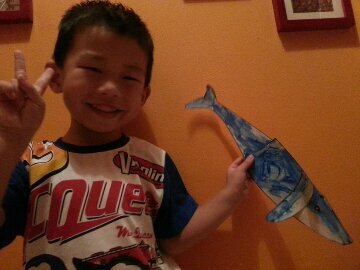 Xxm decided there and then that he liked whales and Xmm loves sharks. This to me, spoke volumes of the kids’ inclination towards independence.In particular, Xxm has a fondness for killer whales and Xmm, the great white. One of our earlier activities was a killer whale craft. 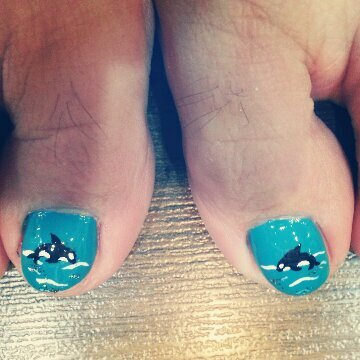 We tried to depict spyhopping killer whales. Having learnt more about whales, Xmm decided that he liked the beluga whale too. So we did another craft from Learn create love.com who is really one talented mummy who created many different craft templates for her daughter to work on. We did the killer whale craft and the beluga whale craft. Sadly, Xmm refused to be pictured with his beluga whale. So here’s Xxm with the completed crafts. 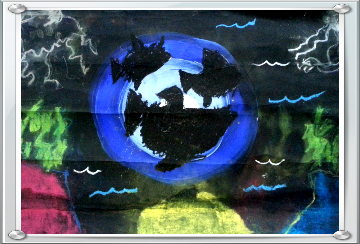 Xxm attended a trial art class at the Artary and lo and behold, the theme was ocean animals too. Through this single trial session, he learnt to draw fishes which were apparently killer whales according to him. With the aquarium at our doorstep, the learning for this theme will not be complete without a trip to the newly opened S.E.A Aquarium. The boys were exhilarated and couldn’t contain their excitement pointing out all the sea creatures they knew. I was fascinated by the shark eggs exhibit. You can see the embryos wriggling inside the eggs. 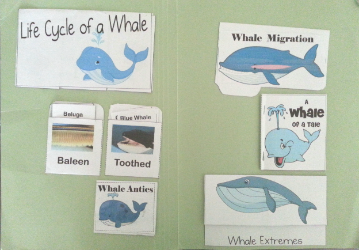 We also attempted the whales lapbook from homeschool share.com. Most of the activities were too advanced for Xxm and Xmm. We read about the concepts but I found it difficult for Xxm to reproduce it in the form of a lapbook. Out of the activities, Xxm enjoyed sorting toothed and baleen whales the most. He also delighted in colouring on the map the regions which the killer whales swim. He knows that the killer whales like to swim in colder waters and the beluga whale likes the icy cold polar regions. 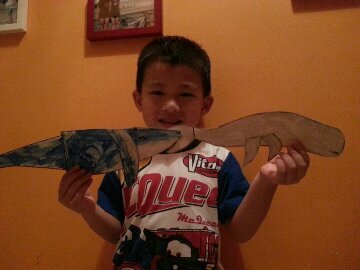 Coincidentally, his school was also working on ocean animals theme and he picked up many concepts from his teacher. These were information that I didn’t think he could comprehend. For example, he mentioned to me that whales are mammals. It made it easier for me to explain the life cycle of the whales and how it differs from the sharks. The trip to the SEA aquarium further cemented this knowledge. This was one of his earlier drawings which the school has taught him. I am an idiot at drawing and have absolutely no idea how to teach my child to draw, thinking it’s a talent more than anything. However, through this exercise, I realised that drawing must be taught too and we can do it by piecing basic shapes together. This was a whole new idea to me. 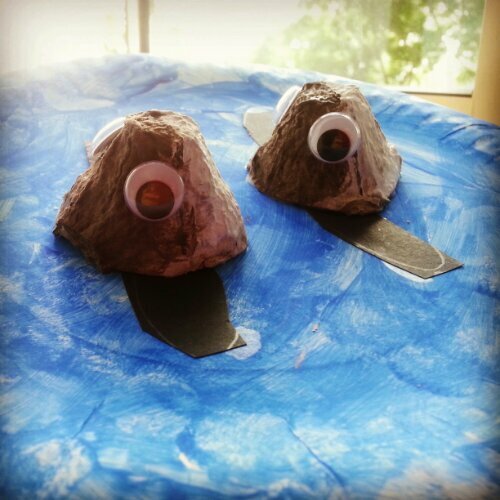 I selected worksheets which the boys can do from the Oceans theme pack in the kidsparkz curriculum. The theme pack is filled with tons of printables (147 pages) suitable for ages 3 to 6. I just didn’t have the resources to go through each and every one with the boys. Each theme pack comes with songs and poetry and numerous literacy and numeracy activities that you can carry out with your children. 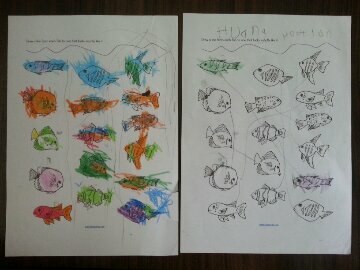 Of these, we did the parts of a fish worksheet and another matching worksheet to train their observational skills. 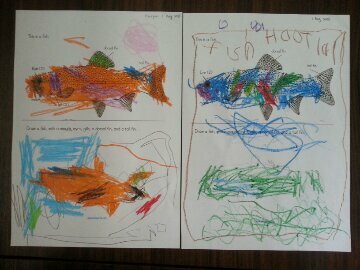 We also worked at drawing a fish. Xxm did a fairly decent job at imitating but I thought the art trial at the Artary did a better job training him to draw with shapes. We also identified the parts of a fish on our marketing trips, our visit to the aquarium…basically whenever the opportunity arises. Subsequently as we read more books on the different types of whales, Xxm became very skilled at identifying the various types of whales based on their dorsal fin. 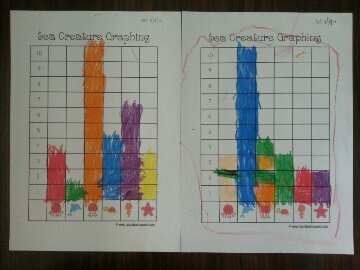 This is the first time we did graphing with the boys. They love it and ask to do this activity repeatedly until the lifespan of the paper cube ran out. 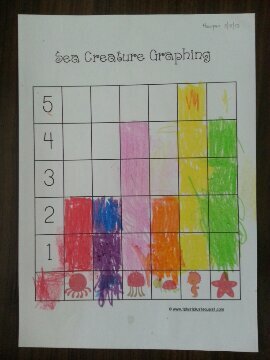 Our sea creature graphing printables came from 1+1+1=1. I couldn’t resist this because the graphics were simply too adorable! Xxm did the graphs from 1 to 10. There was another option for Xmm to do the graph for 1 to 5. Killer whale, killer whale, where have you been? I have been, I have been swimming in the sea. Killer whale, killer whale, what did you do there? Spyhopping, lob tailing, anything I like. Sometimes, I leave the last sentence hanging for the boys to fill in. We sang so much of this that Xmm came up with his great, white shark version. Even the baby Xmx is tickled by this song. Perhaps from listening to the squeals and giggles from his older brothers. We also made a lot of references to the Oceans movie, revisiting various scenes. Xxm knew so much about the subject matter that he was called upon to share his knowledge about various whales with his classmates. Through reading, he learnt about the habitat, predator – prey relationship and many more. 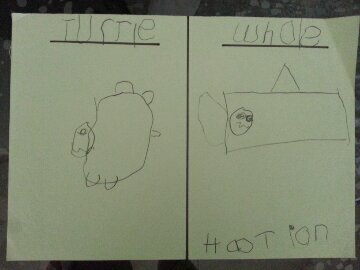 After such intensive reading, I am ashamed to say that I still cannot tell the whales apart except the very obvious. But Xxm could! Lastly, to show my ardent support for my kid’s interest, this is what I did! I don’t know about your kids but mine absolutely hates a car seat. Perhaps it’s due to the fact that they have never gotten used to one before since we only purchased a car slightly over a year ago. It’s also because we never did manage to secure the car seat to the car. It just slides around no matter whether we strapped this way or that. And because we didn’t know how the kids will take to the car seat, we bought one to try and another booster seat. But the boys just end up fighting over who gets what, depending on how best I sugar coated each apparatus to entice them. So for a period of time, we went without any seats. Will I get the traffic police knocking on my doors soon? 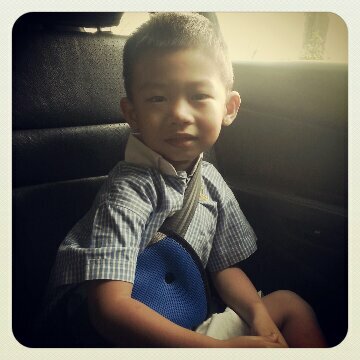 The boys were simply buckled in like an adult and if the strap was in the way, it was simply arranged to the back. Not a very safe option I know. Hence I am always driving with this trepidation in my heart. 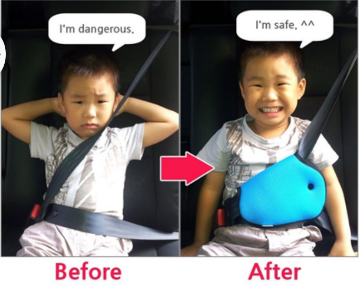 So imagine my excitement when I discovered the child safety belt positioning pad! Check out the merchant’s pictures below. 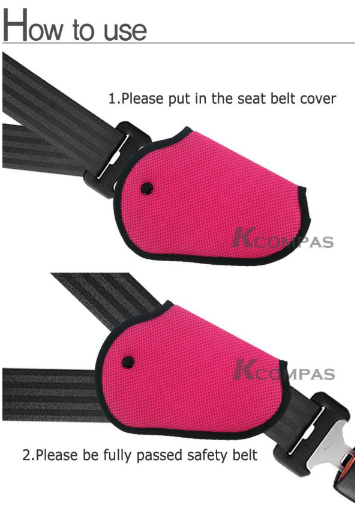 This seat belt adjuster provides proper placement of the safety belt and makes for a more comfortable and safer ride. 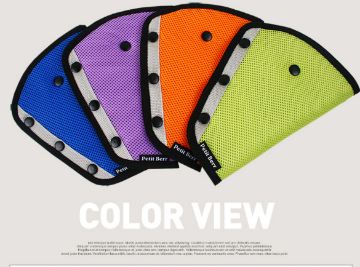 The product hails from south korea and its made of air mesh fabric so it doesn’t pile on the heat. This is a plus for my kids who are very finicky about staying cool. It’s also been crash tested and proven to work for adults. So instead of sliding the seat belt through the positioning pad, I simply unbutton this new pad and lay it flat against my child’s abdomen. 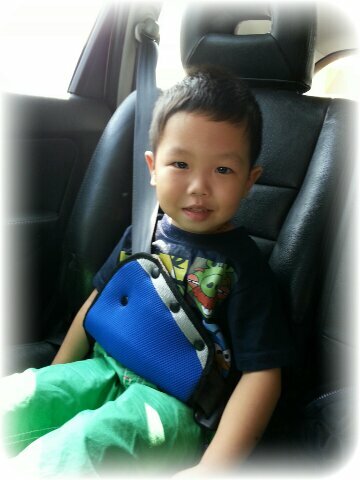 Then, I will buckle the seat belt for my boy in the usual way. After careful placement of the seat belt within the pad, I will button the solitary button and eventually the other three buttons in a row (see picture below). Compared to the former, it is way easier for me. The former usually require me to pull more of the seat belt first so that I can get a decent length into the positioning pad. Thereafter I needed to do some fine tuning to get it into the correct position on my son’s body. It does take some awkward bending over and in the first couple of tries, I felt so tired from the stretching and bending. It did get better with more practice. Version II is also made of the same air mesh material on the outside with 100% polyester on the inside. It is available in 4 colours instead of 2 for the former. So, what about my kids’ review? Xmm is three years old and about 96 cm in height. This is him with version II. This is how version I looks like on him. The shoulder strap cuts too close to his neck hence it ended up like this. Xxm is about 110 cm tall. He is also very fond of his positioning pad, so much so he will remind me to put it on for him. I guess the other plus point is its portability. 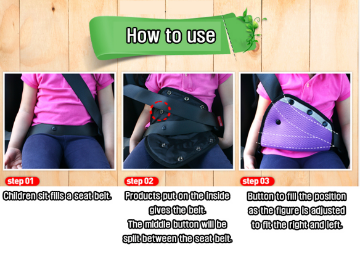 If you happen to travel with your kids on a friend’s or relative’s car, you can easily bring this along instead of a car seat. Due to my short stature, this positioning pad works great for me as well. The merchant has recommended that it is suitable for children, adults and pregnant women. At least for now, we are travelling safer than before. 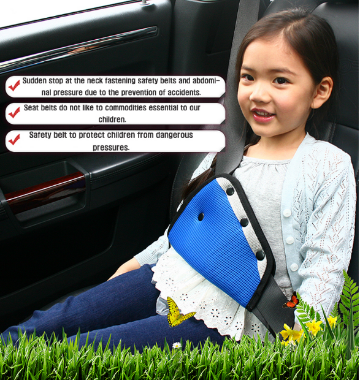 Well behaved and cooperative kids makes for a safer and more pleasant ride. Try one and let me know what you think. A terrarium is a self-contained mini ecosystem that requires minimal care. It is fun to make and makes wonderful gifts. 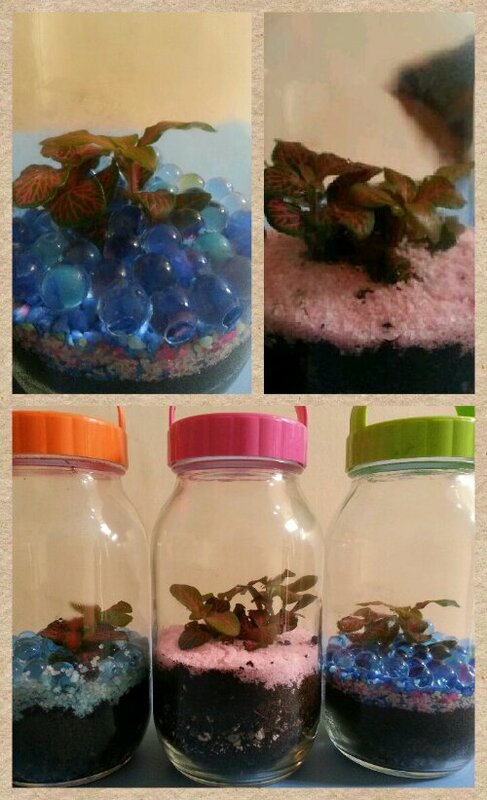 Let Xxm show you how to create your own terrarium. 1. Using any container which you can easily recycle from your home, lay a layer of gravel or stones at the bottom of the terrarium. This serves to provide drainage for the water in the terrarium. 2. Next, layer charcoal onto the gravel. Charcoal gets rid of any odour or smell and keeps the air fresh. Hence this is needed only if you are making a closed terrarium. 3. Dried moss is laid on the charcoal. This prevents the soil from settling down into the gravel. 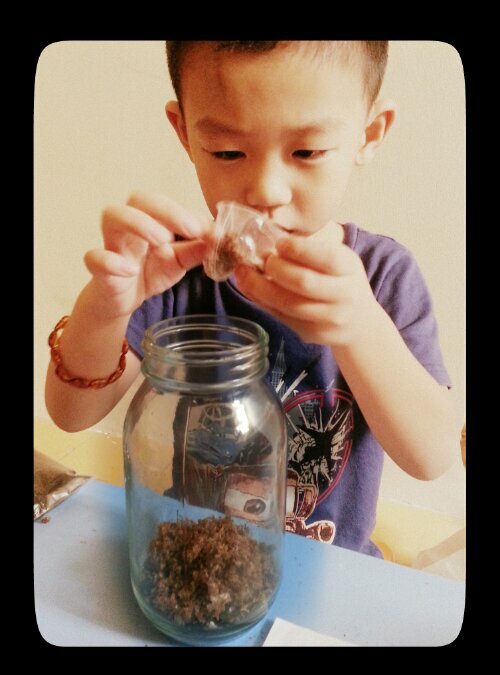 If you are working with young kids like Xxm or Xmm, you may like to prepack the materials in small bags like shown. 4. The next layer is normal potting soil mix. Create a wide hole in the middle for your plants. 5. Put your plants into the hole and cover the soil and arrange the plants. Ensure all roots are covered. 6. For the finishing touch, add decorative pebbles on top of the soil. Xxm is arranging the pebbles with a chopstick. 7. Add about a tablespoon of water to the base of the plants. Cover the lid and there you have it! Your personal terrarium. 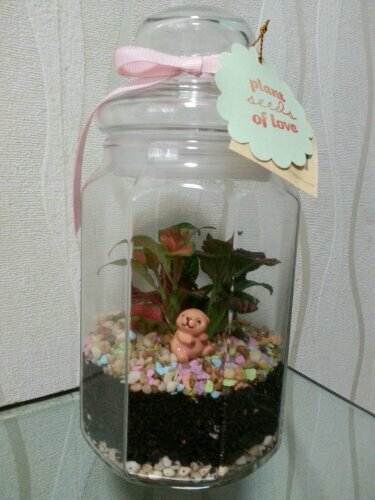 You can decorate the bottle and add cute embellishments together with the plants like this one I made for my husband at the Little Green Pot Terrarium Workshop. I highly recommend this workshop. All materials are provided and the instructor delivers with knowledge and love for his plants. It is also very competitively priced. 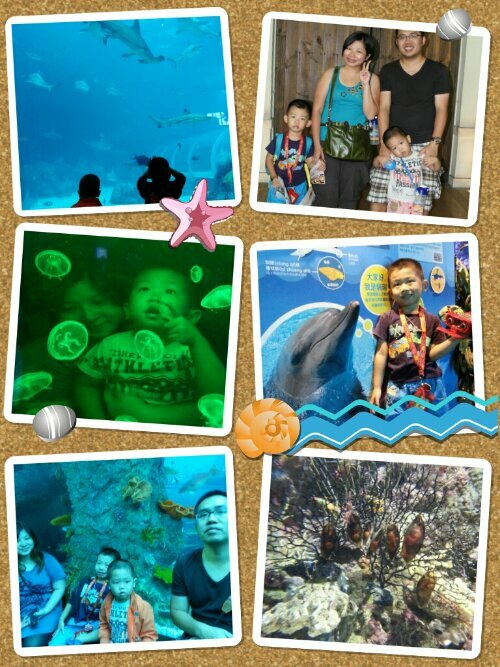 This activity is best enjoyed together with your loved ones. Hope you like it!